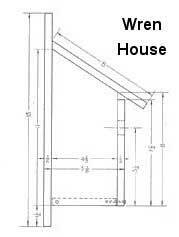 Free woodworking plans to build a wren bird house. Wrens prefer to live near forest edges, open woodlands, swamps, city parks and suburban areas. If a nest box or wren birdhouse isn’t available they will stay in old shoes, boots, hats, garbage cans and many other strange places. Once they find the perfect home they will fill it with twigs, sticks and grass. Then they line it with feathers, hair or wool. With this simple design the birds will flock to your house a lot faster. Nesting boxes of sawed lumber should be painted on the outside to improve their appearance and to preserve them against the effect of the weather. It is often wise to leave a small amount of unpainted surface around the entrance, and all paint should be thoroughly dry before houses are expected to be occupied. 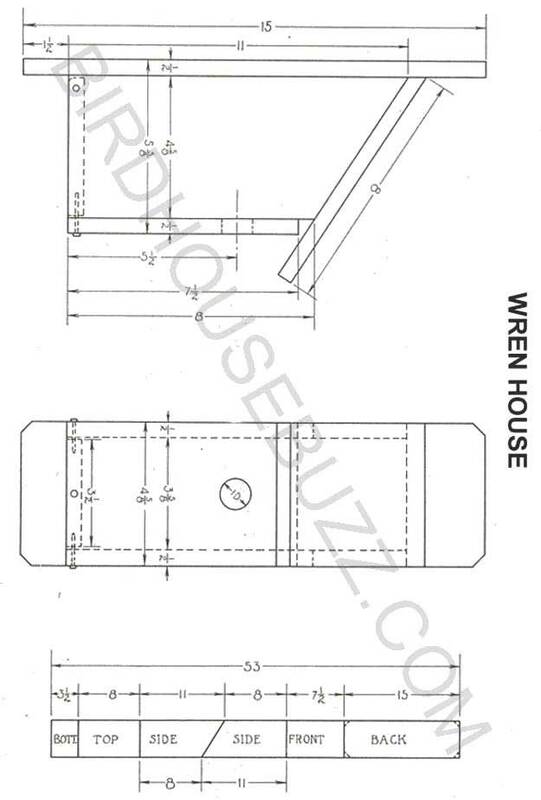 Placing a perch on the wren house design is optional. Wrens don't need them, but it does look nice!